A very fragrant and delightful Northern California native, Lilium kelloggii is a heavy bloomer in its natural setting. The spotted, Turk's Cap flowers are light pink with a golden band in the center of the petals. The reverse of each petal is a darker shading of pink. A dry land lily, it is difficult in cultivation and best left for Mother Nature to grow. We had given up on a seed tray after the second spring and set it out on the "dump" pile. The following year when the tray was to be recycled for another planting of seed, there were hundreds of little Lilium kelloggii seedlings. Our conclusion was that they had not frozen hard enough their first winter. Jan de Graaff used Lilium kelloggii extensively in breeding, and one of the finest of these hybrids is 'Robin'. 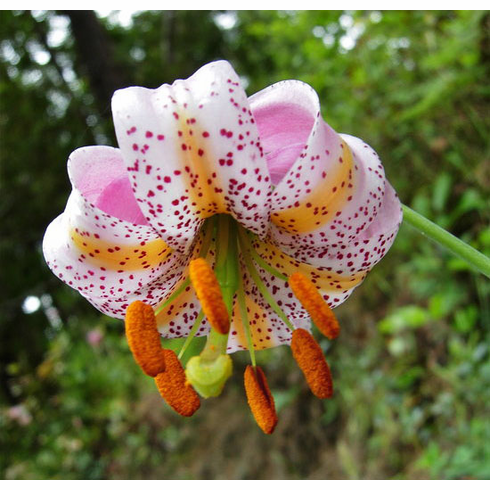 One of our overall favorites, we once "discovered" a magnificent colony of Lilium kelloggii behind the post office in a small Northern California community. The postmaster, needless to say, was very possessive of that little stand of lilies. Title photo of L. kelloggii as photographed by John Doyen in Humboldt County, California. Copyright John Doyen, all rights reserved. CalPhotos source. Used with permission. Photo insert #1 is of Lilium kelloggii is first bloom of cool greenhouse grown plant grown from seed planted four years earlier. Photo insert #2 is of Lilium kelloggii showing off a richer pink form. Copyright Pontus Wallsten, all rights reserved. Used with permission. Photo inset #3 is close up of 'Robin', a Division 4 (West Coast Native) hybrid.